Please Note: Nutrisystem is sponsoring me on this program free of charge for my participation as a blogger in the Nutrisystem Nation Blogger Program. Nutrisystem is offering me 4 months complimentaryon the Women’s SUCCESS Select Program in exchange for me blogging/twittering/facebooking about my weight loss journey on Nutrisystem. I am glad I found this, I have been wondering about Nutrisystem for awhile and don’t have the extra to buy to try, if ya know what i’m saying! Those cookies do look good! I’ve been wanting to try Nutrisystem for a while and I like hearing what you think about the products. Thanks for the review. Thank goodness you can eat those cookies! I would not be able to do a diet very long if it took away my precious chocolate chip cookies from me. Everything in moderation as they say! I’m glad Nutrisystem is working out well for you! Those cookies really do look good. My daughter and I tried NutriSystem a few years ago and we both thought the food left much to be desired. .Especially their microwavable canned foods, like the soups and stews, etc. Maybe they have re-assessed their menu and improved the foods since then. I am glad you are so successful. 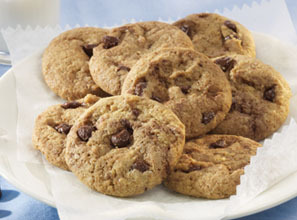 The cookies look OK – not Tall House but then they will help on the weight loss journey. I am glad they offer desert as the last thing you want to do when on a diet is feel deprived. I wish you well.